Painless by Rasputin – Crackerjack!! It’s Friday… it’s five o’clock…. it’s… Crackerjack! Well, no, it’s not – that particular TV programme finished years ago, and all I can really remember is Stuart Francis (not the excellent North American comedian of the same name) prancing about saying “Oh, I could crush a grape” whilst children stood on podiums trying to keep hold of armfuls of goodies. And cabbages. Were the cabbages a good thing? Hmm, I can’t remember. That’s what comes of having to spend Friday evenings eating tea quickly before rushing off to choir practice at the local church. It’s a little known fact that our church choirmaster taught Julian Cope music at secondary school in nearby Tamworth. Unfortunately we never got to sing Teardrop Explodes tunes in church, but that’s another story. And Monday nights were m uch better TV, anyway. Who can forget the heroes of G-Force fighting against the evil of Zoltar in Battle of the Planets? It’s a travesty – there should today a nation of forty-somethings saying “It’s Monday, it’s 4.35, it’s Battle of the Planets!” rather than bleating on about Crackerjack. Okay, so there’s no Crackerjack, but let’s hope for a crackerjack Listener. Yes, I really did type that entire last paragraph as build-up to that rather rubbish pun. Oh, how LWO readers must have missed this. Hmm. Best not go there. I know in advance who this week’s puzzle is by, as one of the trio of setters involved in Rasputin blogs regularly on Listen With Others. Hence I’ve been called into emergency action this week, as there’ll be no solving blog from Shirley. So, let’s print the puzzle off before I leave work, and see how it looks…. Aargghh! It’s a circular grid. Do I not like that, as Graham Taylor once said. I must confess to not being a big fan of circular puzzles. I’ve never really worked out why; it just seems wrong. 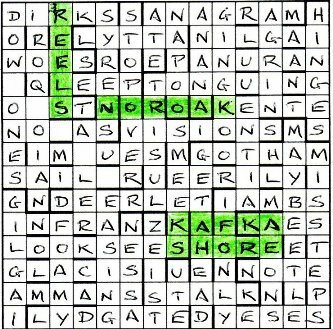 And, if you try to submit the puzzle on the grid as supplied in the times or printed from the Crossword Club website, you end up having to squeeze letters into preposterously small cells in the grid. On that basis, I hope that there is justification for having a circular grid, or I will sulk! Okay, three hours later. Picking up takeaway, etc, got in the way of Listener solving. Chicken Tikka Garlic with mushroom rice. Yum. Now it is Listener time. So what have we got? The first read of the preamble is promising – circular puzzles often involve some radials being jumbled, which we haven’t got here. So far so good. Let’s just solve some clues. So, let’s glance down to see if any obvious answers jump out. 5 Hooligan restrained by Court of Session confesses crime must be something in CS.. TOUGH, probably, giving COUGHS with an extra T. 21, Poor university merits trite remark looks like an anagram – UMERITS*? That must be TRUISM with an extra E. Interestingly, the next clue (which must contain some letters that match those in TRUISM) includes the words “is master”, which must surely yield ISM. So it’s not a big leap of the imagination to think that ISM are shared letters, so I can put somthing in the grid. That’s good, after solving only two and a half clues. Oh, and that answer must be EGOISM. Even better. The next clue, 23, includes the word ‘madam’, which normally indicates M, so I’m guessing that this answer starts with the M obtained from the two previous ISMS. So I’m after a publication that gets its top cut off…. WEEKLY would give an answer of MEEKLY, which would fit the definition. That’s good. I think I’d have preferred ‘supporting’ rather than ‘supports’ in that clue, though. Hence 24 must either end in ‘EEM’ or start in ‘MEE’. Don’t know. Let’s move on, noting that the outer ring, at this early stage, reads ‘YET’. The outer ring must surely contain thematic information (it normally does in circular puzzles), so I suppose it could be the actual word ‘YET’, or part of something else. Maybe we’ve got a circular puzzle based on EYE TROUBLE. Or even YETI. Surely any thematic message would be clockwise, rather than anti-clockwise, though? But this is just speculation, and we need cold hard facts. More clues. www.conjunctivitis.com. Now there’s a site for sore eyes. If you like poor puns, then he’s your man. Anyway, inbetween all of this televisual frivolity, solving has continued apace. We’ve found some STIFFS in ODESSA whilst consuming some SALADS and wearing FLARES, got EMBOGged for a while (okay, it’s EMBOGS, but that doesn’t work), and sung some OPUSES whilst under ATTACK. In fact, we’ve solved over just over half of the radials in a couple of hours, and are now seeking some inspiration to try for a Friday night finish. And, we might just have it! It can’t be coincidence that there is CHURCH CL going anticlockwise in the NE part of the grid. And it looks as if my reminiscing about my days as a choirboy may have been some use as that must surely be CHURCH CLOCK. There’s only one poem that I know that involves the words ‘CHURCH CLOCK’, and that’s by Rupert Brooke. So, let’s just google to remind myself of the words of the poem… Ah, there you go. I can write in ‘STANDS THE CHURCH CLOCK’ without further ado, except there’s obviously some way to go yet regarding the remainder of the outer circle and the other circle that contains thematic information – it will probably be made harder by the fact that there are words omitted, presumably to get the quotation to squeeze in to the number of cells available. Not sure what is going on with the message from superfluous letters, however. I do have the number FOUR there, so maybe the radial two is important? Hmm, not sure. Let’s solve some more. And see if we can rescue the hamster, who is trying to climb up the chimney. Half an hour later again (and a typically rainy weather forecast – will spring ever arrive?) and there’s a flash of inspiration. We have ‘ALTER FOUR CELLS’ from the message, and there, sitting straight in front of us in the grid, are REVERT and BRONZE. Change two letters in each of those answers, and we get RUPERT BROOKE, the poet. Very nice indeed! And now something else becomes clear – the poem refers to ‘ten to three’, and, lo and behold, if we highlight RUPERT BROOKE, the poet’s name represents the hands of the clock in the correct positions for this time. I like that a lot. Twenty minutes later, and we’re done. We have OLD VICARAGE in the cells containing circles, RUPERT BROOKE at ten to three, and the relevant lines of the poem in rings 1 and 5. All in all, an excellent treatment of the theme, and I’m glad that’s it only ten to eleven in the evening now, not ten to three in the morning! If I did have one complaint, it would be that there are a large number of answers that are plurals, but I guess that couldn’t be avoided. 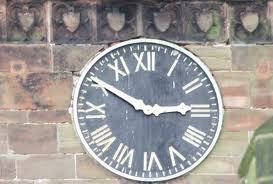 And yes, with the grid being a clockface, there is justification for the circular grid. I’m pretty sure I remember a normal square grid being used to tell the time before (the time being 20:01 in a Listener themed around 2001: A Space Odyssey), but I think that’s the only other occasion I can remember a clockface being displayed in a puzzle grid. Well done to Rasputin on their debut – I believe that the three members all have solo puzzles appearing this year as well, so the takeover of the world by the Mad Monk and his cohorts is most definitely on its way! RASPUTIN, as you may have gathered, is a trio of setters: R, A & S who all give their (cryptic) INPUT*. I’m R. We formed last year, and have had one Magpie and two Inquisitors already published. This was our Listener début. Working as a team is never quite as easy as it sounds, and Rasputin is no exception. S tends to collate the ideas and produces the grids on Crossword Compiler for Windows (though A doesn’t have this) and R prefers using EXCEL. We try and fail to have a system. It’s organised chaos that invariably devolves into a slanging match over whose clues should be used. “Painless” was one of our first creations, aimed to commemorate Rupert Brooke sitting down in the Café des Westens in Berlin in May 1912 and nostalgically musing. S is the current “Queen” of the circular grids (having seemingly taken over Mass’s mantle). A had the idea. I was asked to join the team. Whilst not entirely novel in its construction, at least the church clock face justified the circular format, and the dénouement put the hands at roughly the right time. Now all we had to do, it seemed, was get together an acceptable set of clues. We split the 48 radials into three packs (A 1-16, R 17-32, S 33-48) and each submitted our ideas. And find a title (“Peacetime” was the original working title; then came “Hands on”; not until May 2011 did we agree upon “Painless”). Then comes the fun: endless e-mails, degressively more abusive, displays of overt protectionism, nigh on insults. In this case, the message count probably ran to over 50. And that’s before you get to the test-solvers, who tweak and change a few; and then the editors, who insist and insert, delete and destroy. (Though, in this case, they genuinely improved a number, and certainly tightened up the lax or the ill-defined). Direction indicators had been an issue: R wanted as many as possible, so as to make it a particular feature; S said this was not normal practice and would require unnecessary lengthening of the preamble to explain it to solvers; A sat on the fence. The test-solvers didn’t seem to mind too much, the editors were less keen. Almost all of them had to go before the final version (“NW to SE” in one clue was the only true survivor). Tant pis, next time. There was a flood of surprised satisfaction when we finally realised that we had got our slot … this is the Listener, after all. And immense delight with the generous and complimentary reception the puzzle got. Thanks to all involved in the process, test-solvers, editors, all those who attempted it, and of course, to S & A.
PS: I’m not quite sure why (and I’m not certain if he is either in retrospect) but after we’d submitted this puzzle, A created a Rasputin group on Facebook. It still has only three members signed up. PPS: The weekend of publication – by pure coincidence, I assure you – I found myself in Berlin. So I set off to try to find the site of the Café des Westens at 18/19 Kurfürstendamm. It closed in 1915. It is now a Vodafone shop. Ho,hum. So how should we do this? Should I write the first draft of the blog and you comment? Or do you want to do alternate sentences? Or should we all write different ones which are mostly contradictory and then argue about how to resolve which is most accurate and which is the best? The joys of compiling as part of a group! As many of you many know or have twigged Rasputin is more than one setter, working together – a number of comments on our puzzles have identified a different style and complexity within the clues. So this is my recollection of how this went. One of my co-setters has something of a reputation for circular puzzles. I had not set one but thought it would be good to use this expertise to develop a Rasputin circular puzzle. I was mulling on the train what theme would justify a circular and a clock seemed one of the ways to go. While faily obvious, the Brooke poem had quite a bit of promise for the following reasons. “Stands the church clock at … and is there honey still for tea” had 48 letters and so would work for the outer perimeter as it was divisible by 12 and hence could form a circular which represented a clock face. The missing “ten to three” could be represented by the hands of the clock using Rupert Brooke; each word had six letters so fitted very well with the circular concept. Finally, it was the anniversary of the poem relatively soon. I got to work and immediately fired off an e-mail to my co-setters as this seemed too perfect an opportunity to miss. Thankfully it was one of the ideas that received traction with universal enthusiasm and the basic concept was good enough that there was not too much debate. A 48 outer ring was unusual, but there was one in Don Manley’s book and a check of the websites revealed that while this poem had been used before, it was not recent and not in this format. 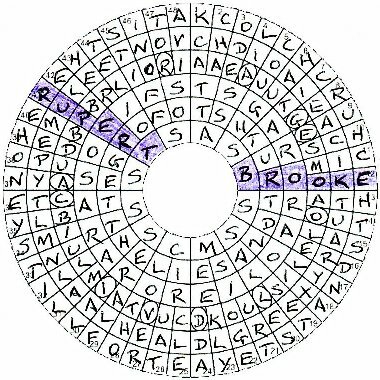 Our circular puzzle expert very quickly produced a grid with a slightly adjusted perimeter, losing the “the” and including “yet”, an interior circle with a further part of the poem “to forget the lies and truths” and with Rupert Brooke reading in the right direction. I spent some time trying to come up with a grid which went back to the original perimeter but failed. The Rupert and Brooke were reversed and both read outwards. The interior circle read “the centuries blend and blur” and a number of clues were entered with a letter missing which when taken together read “the old vicarage”. OK, but did not work as well. Working with our expert’s grid we wanted to include a bit more thematic material if at all possible and debated, trying to have an equal number of radials reading in and out with a message concealed in radials working in a particular direction. Or having extra letters giving an instruction. Once again our expert resolved the issue by changing a number of entries such that “old vicarage” appeared in the third circle using a number of identified letters. So this left the issue of what to put in the preamble and what to include in a message. In order to have the final PDM take place at the end, the changes to get to Rupert Brooke needed to be hinted at through a message in the clues. We debated and decided on “Erase Four Cells Insert Poet”. This happened to be 24 letters. I cannot totally recall now, but I wonder whether these were radials all reading one way. I certainly recall debating whether we could do that. Clue writing followed the usual mostly good-natured course – ha ha. Clue writing for us seems to be an entirely anarchic process. While we started out dividing up the clues and doing one third each on previous puzzles, I find it difficult to explain how they get done now. Broadly it seems to be everyone has a go at whatever they feel like and after some period of time we have a full set of clues, many with a number of alternatives. One setter collects all of this and does her best to keep everyone’s suggestions. We then exchange abusive e-mails, usually go into a sulk for a day or two, patch things up and somehow “agree” on a final set. I would descibe the clue setters as two conventional, and one truly brilliant and very off the wall (sadly not me!). As I recall one of the debates we had was whether you could use directional indicators within a circular puzzle, eg NW etc. On this point we felt they were justified and hoped the editors agreed, which thankfully they did. The editorial process as ever sharpened up many of the clues and resulted in some excellent suggestions (eg 33a), but also required a rewrite of the message to “Alter four cells to show poet”, which was more accurate. The preamble took a while to agree, with plenty of debate around the element referring to “three questions”. I think when it came back from the editors, none of us could quite remember why this was there but chose not to change it – it just about worked. We always have plenty of debate on titles. This started with a working title of “yet”, became “timeless” for a while and finished being “painless”. Many thanks to the editors and test-solvers for their patience and help and to my co-setters for their rude comments on my poor clues. So, finally, does it work setting as a group? Absolutely. The final product is far superior to that which I can manage on my own, even if the path to get there is not entirely PAINLESS. This was a Listener debut from Rasputin, although we’ve had a couple of Inquisitors and a Magpie in the last year. Only about a month ago, there was a theme based on the Goons’ Rhubarb, Rhubarb, Rhubarb, which was great fun with a tough set of clues from what I remember. I suspected that this circular grid would likely have a tough set of clues too. Hopefully there would not be too tricky an endgame in store. Half the radials were to be entered inwards, the other half outwards, with no clashes (ooh, wouldn’t that be nasty?! ), letters latent (ditto) or msiprints in the clues or grid. However, the wordplay in half the clues led to the answer with an extra letter which was not to be entered. It struck me that the structure of the grid meant that there were quite a lot of unchecked squares: letters in the innermost circle were used by four radials, those in the next one out were used by two radials, while the other three were only checked by the outermost circle. Oh well, perhaps Rasputin would be lenient with the clues this time … yeah, right! I got 5 COUGHS and 6 HAUGHS reasonably quickly, but as my eyes read down the page, I realised that, much like the daily commute to and from London, the scenery was passing by quickly without really registering. I tried a few clues at random, but that was even less successful. I decided that Mrs B would have to come to the rescue a bit earlier than I would normally like. She helped a lot, and pretty soon I had 15 or so clues, predominantly in the top right quadrant. Circle 5 now seemed certain to read “to forget the lies and truths”, with pain omitted, hence the title. It was nice to see that the extra letters were in the odd-numbered clues early on, but the even clues at the end. The changeover seemed to be somewhere in the 20’s, but, and was this a deliberate trap, not exactly where I initially thought (19, 21, 24, 26). Of course it all went horribly wrong for me later on when I discovered that at the end, these clues had reverted to the odd numbers. 19 Teak-like tree to plant NW to SE in units was the reverse of SAL + SET, the latter being a word which can mean almost anything, being agreed as the English word with most different meanings. The NW SE reference was the direction that had to be read in the grid, with TESLAS in the opposite direction. 20 Steamship has contracted Shakespearean pro in large rooms was either SALLES or SALONS. The latter seems to have LOON, which is a harlot, trying to get in, although the Shakespearean word quoted in C is spelt either lown or lowne. This was a clue that I had originally identified as not having an extra wordplay letter, but in the end did … a C: SS (steamship) holding [C]ALLE[T]. 40 My team conveniences commonly incorporate mobile sinks the ‘my team’ bit containing an extra letter [W]E followed by M (mobile) and BOGS (which I really haven’t used since my schooldays when it was the slang for the school toilet block). Finally we had to obey the instruction spelt out my the extra letters: Alter four cells to show poet. At one point I had pencilled in ‘give poet’, which caused much confusion for those clues affected! In the end, it was easy to see that 41 REVERT and 12 BRONZE each had to have two letters changed to give RUPERT BROOKE and then highlighted. All in all, this took me nearly 4 hours, but it was an immensely enjoyable puzzle, with the usual handful of tricky clues to get to grips with from Rasputin. Hopefully we will not have too long to wait for his/her/their next offering … OK, OK, they are a they! A number of solvers have commented that Murakami was a new name to them. Three years ago I hadn’t heard of Haruki Murakami either, then a friend lent me Kafka on the Shore and I was hooked, following it up fairly shortly after with The Wind-Up Bird Chronicle. 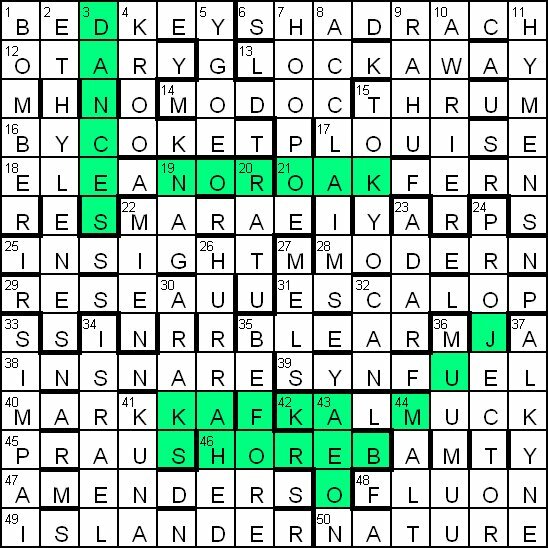 Kafka on the Shore was an irresistable gift to a crossword-setter, with its potential for a well-prepared trap. Thanks, Murakami, for a good read and a promising crossword theme. Many of the titles in the Murakami oevre are susceptible to cryptic interpretation (perhaps too many from a solver’s point of view), so I was keen for the grid to represent some of these. As a starting point I had to have HARUKI MURAKAMI and FRANZ KAFKA hidden inthe grid. I wanted KAFKA to stand out more than MURAKAMI, but as the latter might not be known to many solvers I couldn’t hide him too obscurely, so a diagonal was the obvious choice, thus dictating the size of grid. Fairly early on I decided to include the birthplace, KYOTO, in the grid, mainly because I needed some way of eventually steering solvers away from Franz Kafka as the key author. No PRAGUE, ergo not KAFKA. I confess that the Czech, PRAHA did not occur to me so it was fortunate that it didn’t appear by accident in the grid. The placing of KYOTO was deliberate as I intended it as a sort of pointer to the author (an early version of the preamble contained a somewhat cryptic indication of this, which later succumbed to Occam’s Razor). When it came to a choice of other titles to represent in the grid it was important to eschew dependence on the internet for the solution (to meet editor approval) so I used only those listed amongst the ‘other titles’ lists to be found in my own copies of Murakami works. In the end I narrowed the choice down to Dance, Dance, Dance, Norwegian Wood and The Elephant Vanishes. Remembering an earlier Listener puzzle (or was it a Magpie puzzle?) where the clue number was significant, I chose clue number 3 for DANCES. An early grid had 3 DANCES, NOROAK, a JUMBO to be deleted, KAFKA above SHORE, but no FRANZ, which I was keen to retain if possible. Solvers might consider K A F K A in succession to be coincidence, whereas F R A N Z K A F K A would be an unlikely coincidence, and would therefore detain solvers in the blind alley for longer (apologies for my cruelty). Unfortunately in the end, with all the other constraints, I could not get a satisfactory grid using DANCES . Either DANCES or JUMBO or FRANZ had to go. I didn’t want to sacrifice JUMBO (that was to be the sover’s job ultimately) or FRANZ, so settled for an example of a dance, which is why I ended up with the less satisfactory REELS. At one point I experimented with LITTORAL adjoining KAFKA, but finally opted for the literal SHORE. I also briefly toyed with the notion of some sort of reference to The Beatles, whose song provided the title of Norwegian Wood, but I already had all the thematic material I could cope with. My reject folder included over 80 grids (thank God for Sympathy) so this was definitely one of the hardest grids for me to construct. I was keen to retain symmetry but things would have been far easier without it, and I might have been able to construct a grid in which the deletion of JUMBO left real words, so perhaps it was a mistake to resist asymmetry. I won’t say much about the clue-writing except to say that I hate writing clues for specialist terms like LYTTA – I always find it difficult to marry definition and wordplay in a plausible surface. Many solvers failed to understand the clue to ANANA; it was a lucky chance that I looked up BANANA in Chambers, hoping for something useful to exploit, and discovered at the end of the entries, ‘top banana’, a phrase that was unfamiliar to me but cryptically very useful . The preamble underwent several revisions. The main issue was to provide enough information to enable solvers to be free of any doubt once they had the titles. I was happy to set an elephant trap regarding the thematic author(s), but I wanted the endgame to be totally fair. The trouble with cryptic representations is that they are not always clear-cut. Additionally, other relevant works might appear in the grid unintentionally. I checked that D wasn’t followed by ARK (After Dark) but could I be sure that someone wasn’t going to find a jumble in some shape or form of the letters SHEEPCHASE (A Wild Sheep Chase)? This is why I ended up being very specific about cell arrangements and title word-lengths in the preamble. The test-solve preamble made no mention of rectangular arrangements, which I added later for further clarity. Numbers were not omitted from the test-solve version, but one of the testers, Terry Clarke (Ozzie), suggested omitting numbers from the grid and requiring solvers to enter one key number; I took this up because it eliminated any doubt there might have been about REELS as a substitute for DANCES, especially as the distracting STEPS appears in the bottom right-hand corner of the grid.